Dutch Pro Hydro/Coco Bloom for soft water area is a highly concentrated two part system to optimize the blooming and fruiting of plant crops. For ideal use in Hydroponic home gardens and within coco grow mediums for high levels of crop growth and potency. Using Dutch Pro Hydro/Coco Bloom during the fruiting and blooming phases provides rock hard, potent and large plant crops. Scientifically developed to incorporate all the essential macro and micro nutrients to provide the utmost feed nutrients to plants for a blast of energy to the crop yield. If you want larger, more robust crops from your plants, adding both parts A and B of the Dutch Pro Hydro/Coco Bloom for soft water will give you the ultimate in fruiting and blooming abilities. 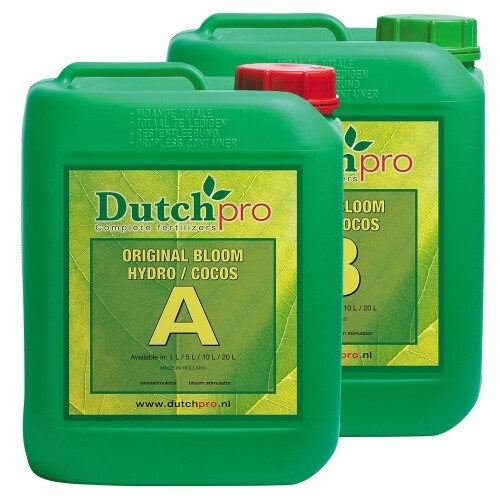 Dutch Pro Hydro/Coco Bloom is specially developed to support plants health and crop production and enhances plants potential to grow super crops that are larger and highly potent with essential macro and micro nutrients.